Nicknames: Dazza, Turner, ‘o’ wise one, OD. 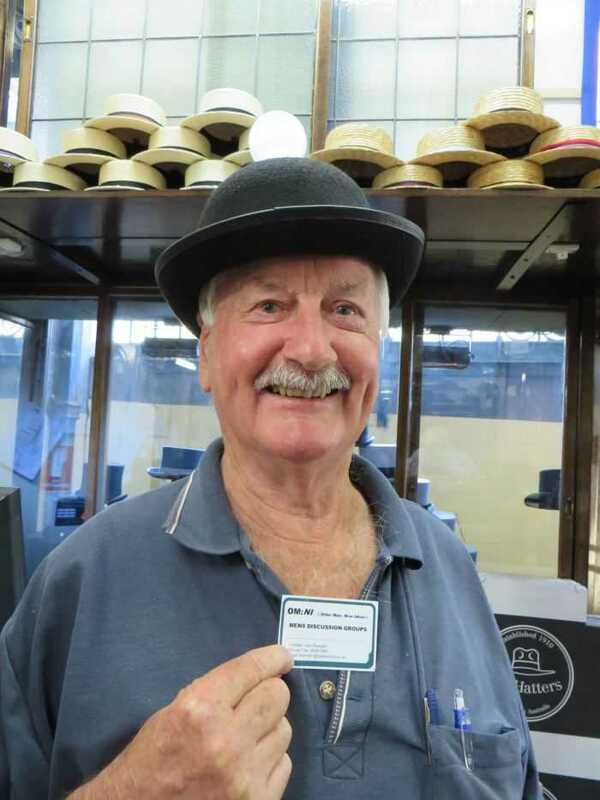 DOB: 2/2/1941 – born in Colac. Victoria, Australia. It was very difficult growing up. We had no electricity, no radio, no TV and didn’t even know about TVs until back in 1956. When it did arrive it was Black and White reception. We had a tin bath on iron legs and bath water from the tank was heated by a wood chip heater. The pipes would fracture if too much steam was created. Even our refrigerator was powered by kerosene. Our toilet was outside, up a long dirt path in a separate tin shed with a black billy container which had to be emptied once per week. To get there at night we used a candle which often blew out in the wind. Toilet paper was torn up paper and speared onto a nail that had been hammered into the wood noggin. When we got a valve radio we could only get one station – 3CS. To listen to the radio we had to take a 6-volt battery out of the 1948 Ford truck and put it in the radio. I grew up on the family property of 110 acres of bush-land that we cleared to grow grass for the start of a dairy to milk cows and to produce pork from pigs. Growing up my main chore was milking the cows in the muddy yard and rain. This was done twice daily seven days a week for ten months of the year, also splitting and taking wood up to the house for Mum’s stove for heating and baking High Tin bread. The meals were mainly stews, spuds and Roly Poly puddings. Sometimes we had a bread and butter pudding. I had to go out in my spare time and hunt rabbits or go fishing for meals, although I was lucky because living on a dairy farm meant we produced all our milk, cream and butter, as well as some seasonal veggies. Later bread got delivered to our house twice a week. Phil the delivery man delivered bread throughout a large part of the Otway Ranges. He used to eat his sandwiches whist driving. He died one day whilst driving. He was on his way to a delivering some farmer’s bread. His wife had poisoned his sandwiches. My family and I lived six miles from town so we only went to town once a week to get food and farm supplies. We went to town every Thursday because it was market day, where farm stock was sold by auction. I attended Barongarook primary school. The school had six grades in one room. There were twelve children in the whole school, with one teacher for all the classes. The school’s heating was just one big wood open fire. We never had very much sporting gear so we relied on running, long jump, tunnel ball, high jump and pole vaulting, using a cut bush stick for a pole. Most sports were competed in bare feet. When competing with other remote schools we only had hard ground, with no grass or sand. We had to take a cut lunch, but cordial was often provided. Raspberry cordial! What a treat! After primary school I attended Colac High school. I walked along a gravel road for two miles to get to the bus stop and then I would go to school six miles away in Colac. I went there until Year 9. It was very upsetting having to leave school. On 2nd February the following year I actually broke down and cried because my schooling was over. I left school when I was 15 and worked on our family dairy farm, cutting wood in the forest and growing potatoes, but I made no personal income. I wanted to carry on with school but our family’s economic situation would not allow this to happen. 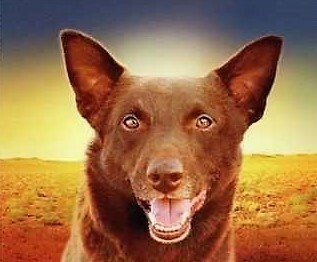 I had a beautiful red Kelpie, which was my hunting dog. His name was Red. We hunted rabbits and went fishing for trout and eels together along the Barwon River flats. Sometimes we slept out all night together under our old green army coat to awake with a white frost on us. When I was sixteen I started boxing and was quite successful in the Western District. I wanted to continue with boxing and thought of it as being a possible career, although I didn’t have any family support and it was a twelve mile bike ride to training. My bike never had mudguards or any lights, so I had to give it up. I was driving cars and tractors around before I was 18 although I didn’t end up getting my license until I was 19. 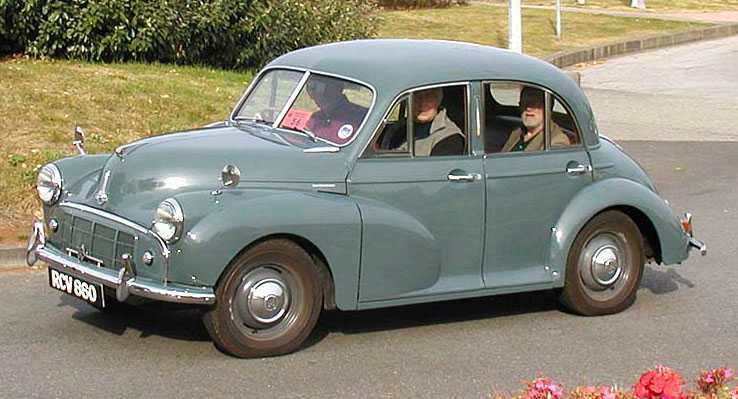 A nice gentleman offered to come with me in his car – a two door Morris Minor – to get my license. The policeman got in the back seat told me to drive around the block, whilst he talked to the owner of the car. On arriving back to the station the policeman said “Okay, come in and sit down”. The only question he asked me was “Have you got a 10 shillings note?” Lucky I did have 10 bob. And that was it – I was licensed to drive. always believed that ‘that war was what tore America apart and split the country’. I am very thankful never to have had to go to war and I believe the citizens should not be accountable and be involved in the war. The leaders are the ones that got the country involved, “why should the citizens sacrifice their sons and daughters”. 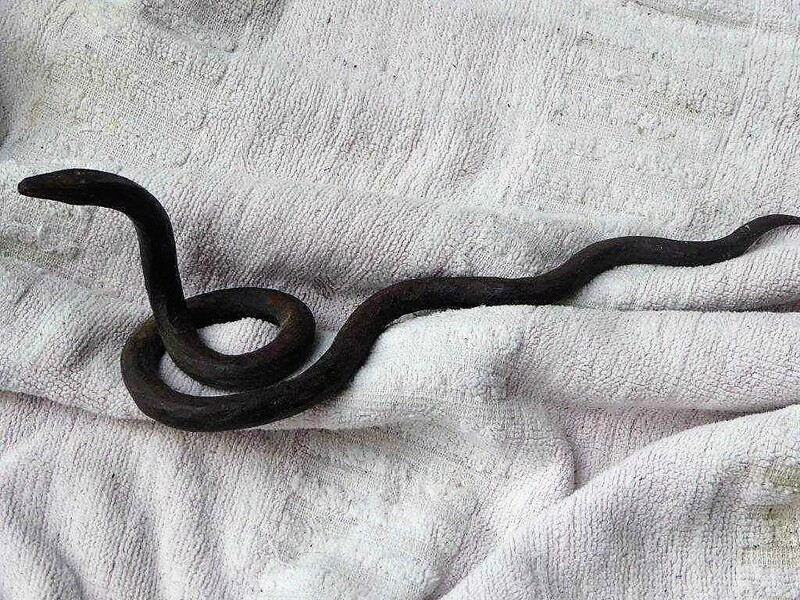 When I was in high school at age 14 I made an iron snake statue in metal work classes. I am 77 now and still have my beloved black snake. For three years my best friend in high school was David Balcombe. It was difficult to remain friends when we left school, because there was no electronics like mobile phones or iPads. It was only in the late Fifties the late that we got a wind up wall phone. Even then you had to ring the telephone exchange and ask to be connected to a particular number, and the exchange closed at 9pm. The only other way of contact was to ride bikes or walk miles in order to see friends. Many a time they were not home. Strange as it may seem we both married girls named Florence. David’s father was a shearer and he got me a job as roustabout in the sheds, sweeping the floors and penning the sheep as well as throwing the fleece. I learned how to control the Kelpie work dogs. it was a great learning curve that I loved. I worked 5 days and got £20 a week ($40) plus keep. After traveling and working around Western Victoria and parts of NSW and SA I wanted to become a shearer because the money was so good and you only worked five days a week. On my first full day, from 7.30am to 5.30pm I shore 77 Merino sheep and I was so exhausted that I could barely walk to the shearers’ quarters or eat my evening meal. I met many hardened true Aussies around the shed. They were hard as nails but with hearts of gold. It was here I learned the value of drinking long neck cold beer after a hard day’s work. I also learned it was a lonely life as a shearers’ cook. Men are so hard to please! At Penshurst the team sacked the cook and on Monday a person from Tattslotto came to the shed looking for him as he had one won first prize of £10,000 ($20,000 of today’s money). Boy, was the team pissed off about all that free beer they had missed out on! 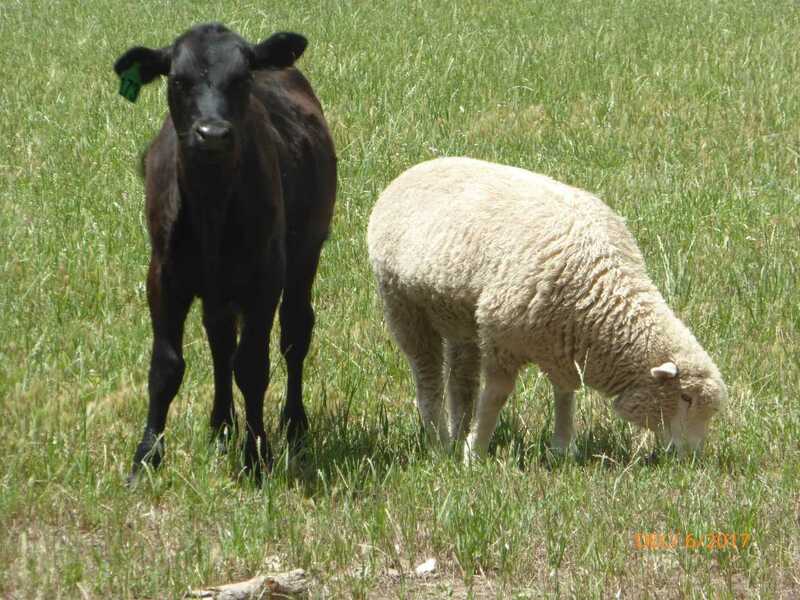 Sheep and cattle were in my blood, so after Florence and I got married we worked on farms and large acreage stations. We got $36 a week and we were provided with our house, eggs, milk and meat. Bear in mind you worked six days a week from 7.30 am to 6 pm and got half a day a month to go shopping in town some forty miles away. In February 1966 decimal currency became our new currency, replacing our Pounds Shillings and Pence. Monetary values were: one pound =2 dollars; one shilling = 10 cents; one pence = 1 cent. We went to a family owned grocery store in Hamilton run by an elderly mum and dad who asked us to work out the amount we owed them, you may laugh but many people found the change over hard to adjust to, and even harder when metric measures replaced Feet and Inches. In 1970 I managed a cattle farm in Kangaroo Ground (750 acres). One day I went out to round up cattle and the horse – a 17 hand Arab – lost his footing and crushed me onto big rocks and broke some of my limbs, jaw and teeth. I was concussed for 48 hours and spent many days in the Austin Hospital. This was the time Whitlam was Prime Minister and he offered adults free education to further their skills. 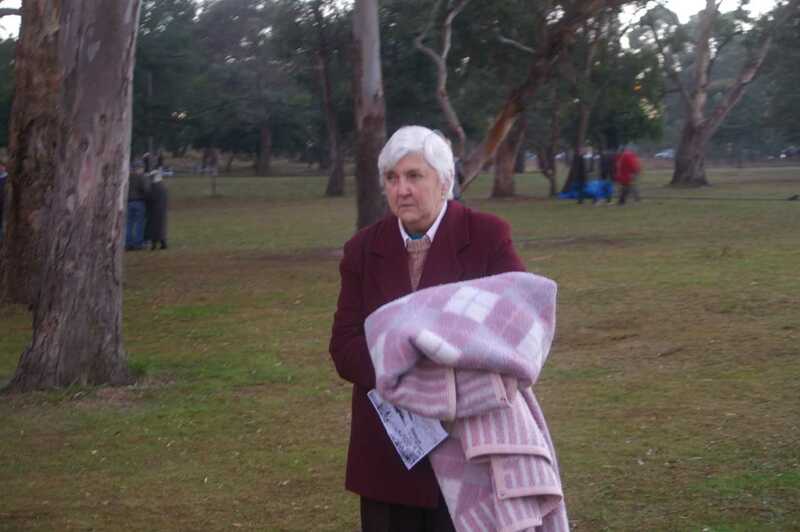 The Whitlam program of further education was offered to me because of the accident. I took up this offer and completed my leaving certificate and a 5 year course in Real Estate at Prahran College, where I achieved my full Real Estate license. At the same time I was working in real estate at KG McGorlick Real Estate in Eltham. I had my first date with Florence who worked at the market. I would see her on Thursday, the market day. Boy, could she carve up a pumpkin with that meat cleaver! She was working in the fruit and veg market. She was a pretty good looking sort, with big flashy eyes and a smile like the sunrise. Anyhow, I went on to marry her when she was 18 and I was 19 and we are still together now. I used to ride my bike six miles to get to her to go to the movies which only cost 1 shilling. I met Florence at the market as I held up the chooks and ducks for the auctioneer to sell and she worked amongst the cabbages and pumpkins on the other side of the arcade walkway. We never really concentrated on our jobs on Thursdays for some reason. Later my Dad told me he delivered wood to her family home. What luck! Even Dad thought she was a good looking Heifer. 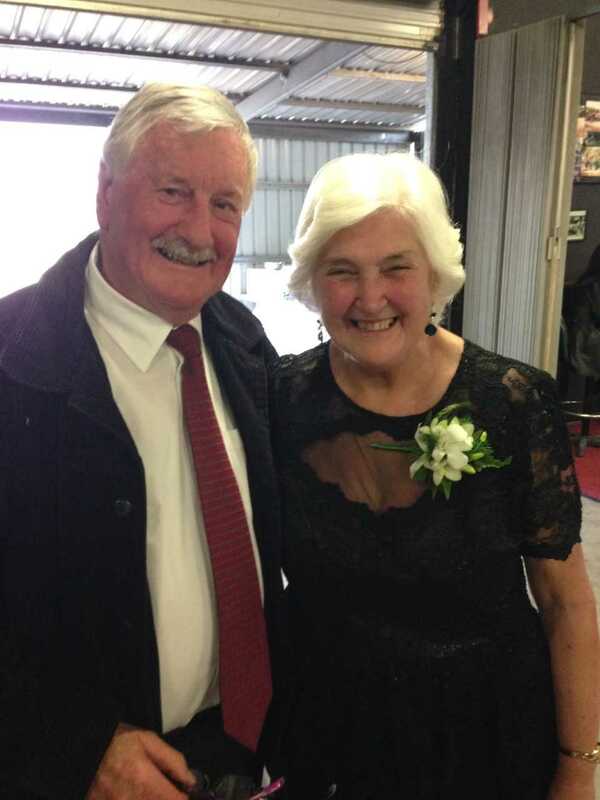 Florence and I married in Colac. It was a small happy ceremony with just both families in church. We had our honeymoon in Mount Gambier and Adelaide. Florence and I went on to have two children: one boy, Steve, who was born in Casterton on 1 January 1961, a New Year’s Day baby, and one girl, Cindy, who was born in Willaura on 13 December 1962. We went on to be grandparents. Cindy had two children, Kathleene and Luke, and Steve had three children, Kimberly, Jacqueline and Monique. I have always said I loved having a daughter as I never had a sister and having a son was so self-fulfilling. We had replaced ourselves as the Government had advised people to do so as to avoid over population. Looking back now, that didn’t work! Cindy attended Kangaroo Ground Primary School for three years. Steve and Cindy attended Hurstbridge High School and Eltham High School. 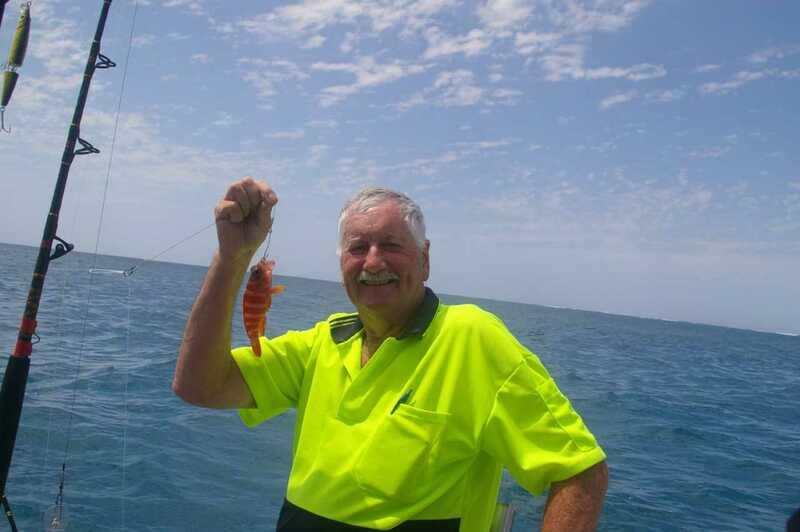 I have worked in real estate since 1973 and still work now and then as I have a full license. I am now 77 and semi-retired, but I have retained a keen interest in Real Estate. I decided to work in real estate when we moved to Eltham and spoke to a real estate company who then offered me a job. Norm Baxter was my mentor and he trained me in the basics of real estate. 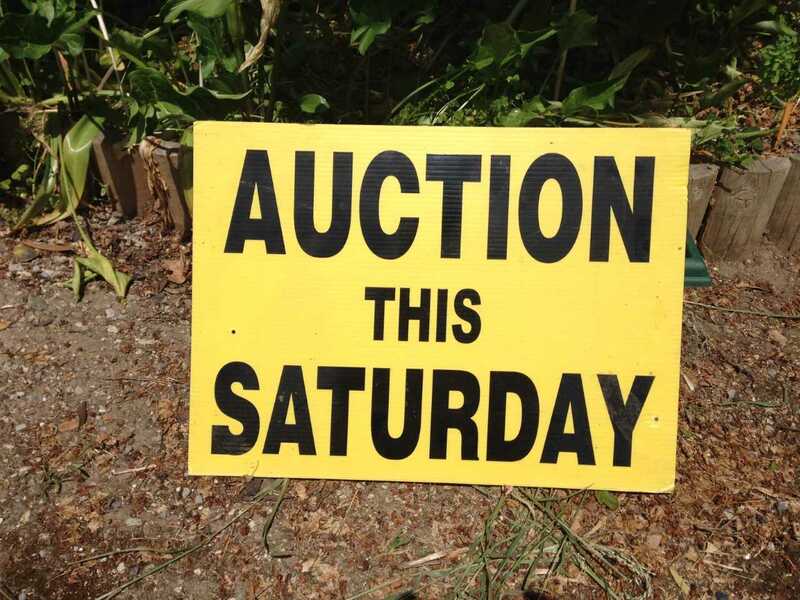 My very first auction was in Pryor Street in Eltham. Before it sold I was down to $50 bids. The property was owned by the Education Department. My most memorable real estate moment was when I dressed up as a Policeman with an English Bobby hat and all and auctioned off Diamond Creek Police Station. I threatened the crowd if anyone misbehaved I would have them locked up for the night with no bail being offered. Real estate was a lot different back in those days. The women did all the typing and took all the phone calls, but as time went by and computers and telephones came in, men had to learn how to use them. The women that usually did all the work for the men started to refuse to do all the typing for them. Finding out about OM:NI in Diamond Creek – a group of like minded men over 50 who have retired or lost direction and connection – has been a highlight. It is now almost seven years that I have going to meetings and I have seen some very great gains and friendships made here. Sadly we have lost two valued mates through sickness. They were 89 years of age but still running on 20 – active mates. 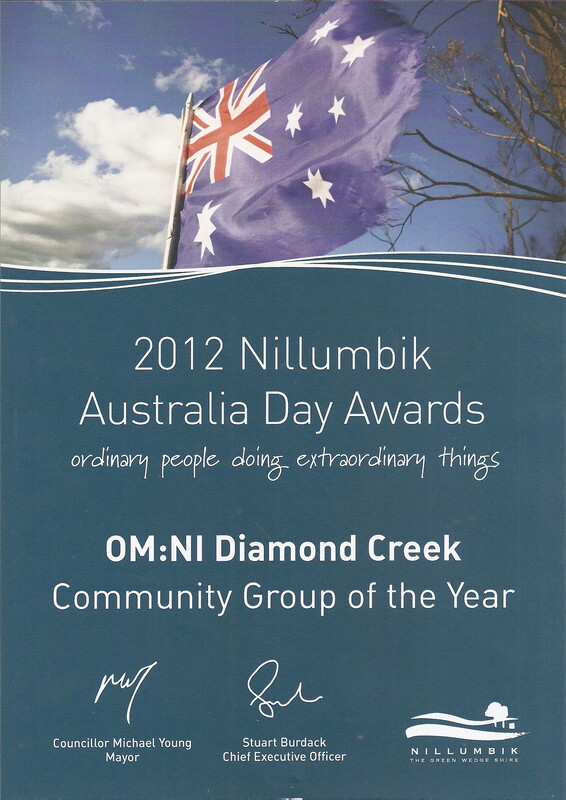 In 2012 our group won the Australia Day Award for Community Service in Nillumbik and in 2018 our founding Father won a Community Award for Jagajaga which was presented by Federal Minister Jenny Macklin. In May 2011, I was awarded the Sir Kelvin award and duly Knighted Sir Daryl by the group. Now both Mum and Dad have travelled on. …………Now Lady Florence holds my lantern and I’m 77 and still going strong.